This part of the planet was already beginning to resemble the splendour of Nurgle’s Garden, or at least it resembled how Morior imagined that magnificent place to be. Clouds of fungal spores drifted through the air, giving everything a tinted, greenish look. The ground was covered in wondrous plants, the likes of which had never grown on this agri-world before. The vitality and life nurtured by the blood-soaked ground was humbling. Morior held a rack of vials aloft to allow the greenish sunlight to glint through their deep red contents, giving them a murky brown look. This is what he had been sent here to collect. A satisfied smile spread across his hooded face as he diverted his gaze to the gunship that would bring him on the first leg of his journey to his laboratory on the Birth.Death.Rot. It will take some work to combine this Astartes’ blood with the Sanguous Flux, but Shurghol’gh will be most pleased with this offering. The premise for this Kill Team campaign was that a Death Guard Plague Surgeon (Morior) was collecting Adeptus Astartes’ geneseed and where better to harvest it than from a Deathwatch force with a diverse array of chapters represented. 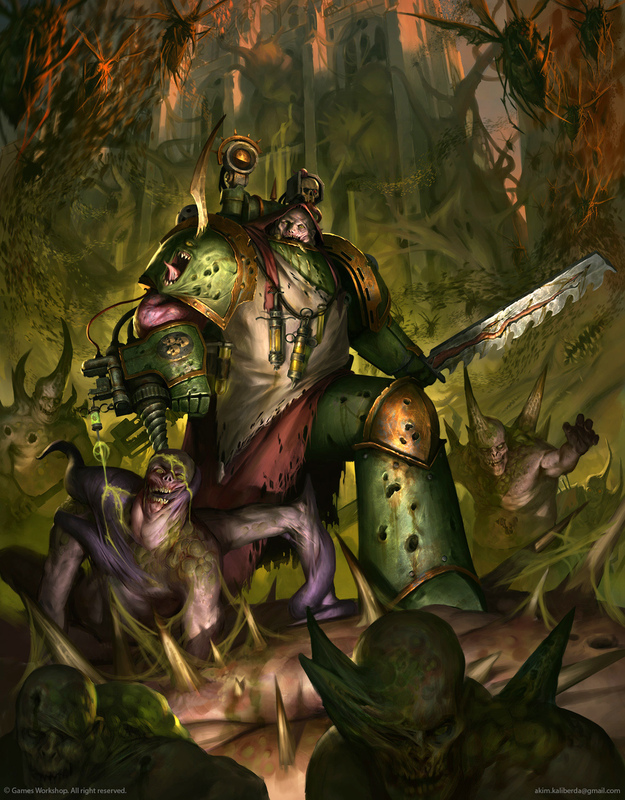 The conflict was set on Benus Marjoris, a vast agri-world that is in the middle of a titanic struggle between the forces of Nurgle and the Imperium. Much of the fighting occurred in subterranean complexes used to irrigate the crops of the planet. Dan and I decided we’d us the Resource campaign, tracking Morale, Materiel, Territory, and Intelligence with each game loss causing a drop in these resources. The campaign was a close run thing, with Dan having Intelligence sitting at 1 and me having Territory of 1 going into what turned out to be the last (of over 20!) game. Dan managed an easy win when my audacious strategy fell apart. I’ve enjoyed this campaign, but compared to the Death Guard the Deathwatch suffer from a lack of numbers. This becomes apparent in Arena games, where grabbing objectives is all important. That said, their Special Issue ammo and access to Primaris and some great weapons make them a potent force.